My name is Terry Soleas, I’m an Education Consultant with the Office of Professional Development and a PhD Candidate in Education. I have the privilege to work in your Faculty of Health Sciences. In a collaboration between the Indigenous Health Education Working Group, Faculty of Health Sciences Decanal Leadership, and the Office of Professional Development and Educational Scholarship, we are pleased to present three days of extraordinary reconciliation in healthcare events. 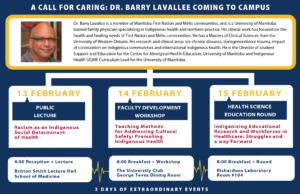 Our keynote speaker at all three events is Dr. Barry Lavallee of the University of Manitoba who is our guest for the three action-packed days on campus. Dr. Lavallee has proven to be a dynamite speaker who speaks plainly, practically, and passionately on issues of social justice in medicine, with a particular focus on rural and northern indigenous communities. These are remarkable and free events that go a long way in Queen’s ongoing Reconciliation efforts. I hope you will join us at many of these events and help us make our future at Queen’s and beyond better, kinder, and brighter!